Forty-five girls who are students at three Nottingham high schools took part in an Ada Lovelace Day event at leading life sciences incubator, BioCity Nottingham, to learn about the opportunities of a career in Science, Technology, Engineering and Mathematics (STEM). The event, run and coordinated by BioCity, Ignite! and Nottingham Trent University with support from the STEM Ambassador Hub at Derbyshire Education Business Partnership, was organised as part of Ada Lovelace Day – an international celebration of the achievements of women in STEM. Ada Lovelace was the daughter of Nottinghamshire poet, Lord Byron, and is recognised as the first computer programmer for her revolutionary work on the analytical engine. The all-girl group of Year 7 and 8 pupils from Farnborough Academy, Nottingham Free School and Nottingham Academy, took part in the session, which was designed to inform and encourage young women to get involved in STEM by showing them it is an accessible and appealing career path. The event involved the students, aged between 11 and 13, taking part in exercises such as ‘draw a scientist’ and ‘people like me’ that illustrated that people with similar personality traits and skills are successful working in STEM and can be scientists, whilst challenging stereotypes surrounding who scientists are and what they look like. 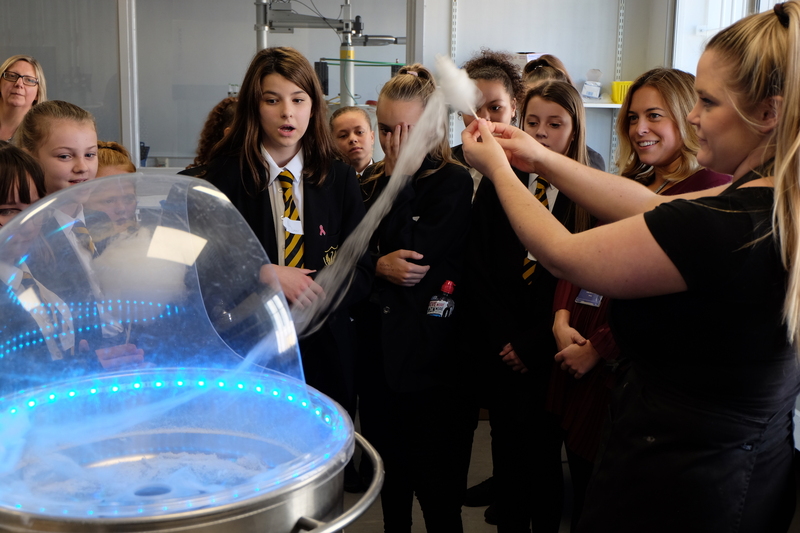 The pupils were given a tour of BioCity and a demonstration of the Floss Whizzer - an invention which uses an air vortex to shoot clouds of candyfloss into the air at 60mph, as seen on The One Show and Gadget Man. The pupils also watched presentations from four women working in or studying STEM: Chiletam Hanson Ogbu (Nottingham Trent University); Billie Crowe (Azotic Technologies); Lorna Duffy (Sygnature Discovery) and Yvonne Barnett (Nottingham Trent University). “The Ada Lovelace event brought together a number of brilliant organisations working to promote the STEM subjects to young women, including representatives from BioCity-based companies: Sygnature Discovery, Azotic Technologies and XenoGesis. “In the STEM industry as a whole, just 23% of the workforce are women and the UK has the lowest proportion of women in engineering in Europe. “This event was a brilliant opportunity to showcase the work being done by female scientists in both universities and businesses in Nottingham. “I was delighted to support this exciting and important initiative on Ada Lovelace Day. I have been very fortunate to have received great support from others in progressing in my career in STEM and I am committed in doing the same for young women considering going into the field.